Magic users have a selection of tools that they use in magical workings. They are set out on an altar ready for use. In themselves these are tools and have energy in themselves formed by their constituent parts. Your use of the tools will enhance their energy in line with your own level of abilities. They do not do the job for you but are energised tools to help you. Tools are divided into God and Goddess items and are set out on the Altar in line with this. The rule of thumb surrounds the shape of the item anything long is male and therefore God related anything with a bowl is female and Goddess related. Ritual knife or Athame – this is not a sharp knife and is used for describing your circle it is normally a black handled knife. These can be very plain or extremely fancy depending upon your choice and your pocket. If you want to be more discrete about your practices you can choose one that is quite plain and unremarkable to others eyes. Wand – this is for directing energy and energising other objects. They can be purchased ‘off the peg’, or you can have them made for you (see my Made to Order page) or you can make them yourself. They can range from a simple stick to an elaborate wood, crystal and metal construction. You may even find that you have several wands that you use for different purposes. Remember that if you make your own and collect wood and any other constituent parts from Nature you should, where possible, take items that have already fallen. If that is not possible only take what is needed and take responsibly from the plant. You always request permission from the God and Goddess/Universe to take what you need and leave a gift in exchange. Your gift can be a stone or arrangement of stones by the tree, corn, a ribbon tied to the tree, whatever you feel is appropriate. The point is that you acknowledge the gift with thanks. Some people have the view that the wand is the tool for women and that men would use a staff instead. Cauldron – this is used essentially for burning things in! They come in different sizes and made from different materials so choose the right one for the job in hand. If you want to actually cook food in a cast iron cauldron make sure that it is of an appropriate quality for cooking and that you keep it separate from any cauldron that you use for burning incense or other purposes. You will also need candles on for the God and one for the Goddess. Keep a selection of colours as you can also use a third candle to represent a particular topic that you are working on. Representations of the God and Goddess. These can be statues, pictures, a holed and a straight stone depending on the style you want for your Altar. Boline – this is the white handled knife. It is a sharp knife and used for chopping herbs etc. Many people have a multi-tool and folding saw instead of an specific boline, it really depends on the use you are going to have for it. You must be very careful about the tools you carry outside and keep within the legal requirements. You can add anything else that you feel you would like. Altars can be created to reflect the time of year and the ritual you are working on. You may wish to add a pentacle. If you wish you can have dedicated clothing to wear that is kept separate from your everyday clothes together with any jewellery that you feel is appropriate. 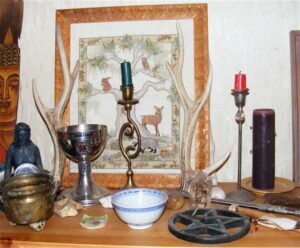 An idea of altar layout. You can choose which, if any, of the tools you wish to work with. Of course, you do not have to go out and get everything all at once either you can gradually bring together the right things as they crop up. Now you are ready to begin to learn how to use the tools and your Craft. Before you start there are one or two things to bear in mind by way of conduct. Be careful what you do, in other words before you start really think about what it is you wish to achieve and how you are going to go about it. Be careful of the people you trust. Not everyone will understand or treat you with respect. When you start out err on the side of caution and only talk of your Craft to people you absolutely know can be trusted. Never use the Power maliciously or with bad intent. Remember what goes out comes back – and some! Dependent on viewpoint this can be returned x3 or x10. Generally I find that if you have accidently done something wrong what comes back to you is not too bad but will make it quite clear you have goofed. When you do something deliberate – look out! Never use the Power against someone who also has the Power. You are linked in your Power. Always work from your heart and your intuition and in this way you will always do the right thing. It takes practice to know the difference between head and heart but you will get the hang of it.